smiles...glad i got to share a bit in that trip...and to the mountains as well...was beautiful up there at the lake...glad you and hubs made it to your next stop safe as well...lovely bit of verse....smiles. My birthday is in May too - and that's not the only reason I love it. Here in Scotland we get wonderful long evenings from May through July, which helps to make up for the long, dark winters. Ah this made me feel wonderful! 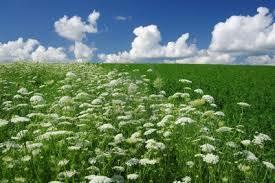 Queen Anne's Lace :) When I let my cilantro bloom, it looks just like that...nice poem!
" . . . lush grasses weaving waving . . ."
A most aesthetic piece . . . I felt every breeze came through your piece.